TRULY ONE OF A KIND PINEHILLS home located in Great Island Del Webb 55+ neighborhood. This detached Redbridge model was designed for 1 level living. Loaded w/ upgrades, nothing was missed when designing this showcase home.Large floor plan w/ combination living room, kitchen & dining room features warm cherry floors, upgraded lighting, custom built ins & a stunning fireplace w/ custom mantle. 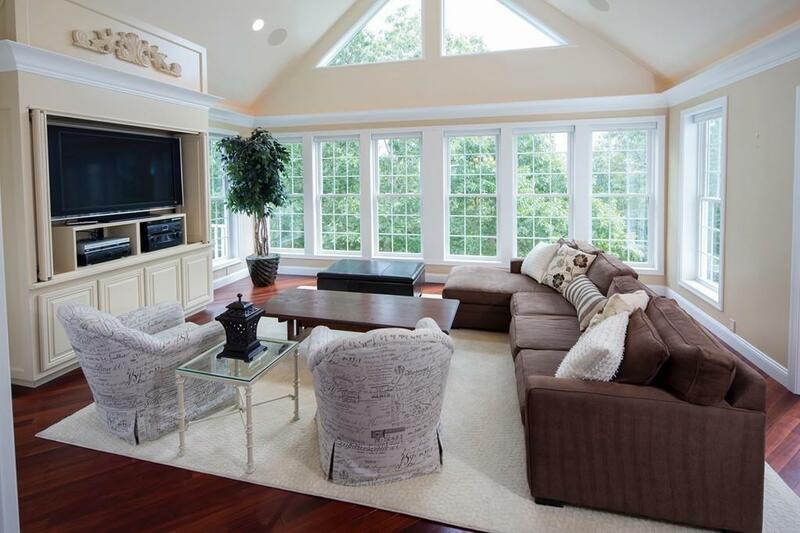 Off kitchen & dining room enjoy a spectacular 4-season sunroom w/ access to a deck. The first floor is flanked by columns, crown molding, custom trim & offers a spacious master en suite w/ vaulted tray ceiling & 2 additional bedrooms, one that could be a perfect corner office. The home is equipped for surround sound on most of the first floor as well as the downstairs enclosed patio. The lower level has a large family room, office space, half bath, enclosed patio, workshop, & storage room. Amenities include indoor & outdoor pool, exercise facility, club house, lawns mowed, snow & trash removal.